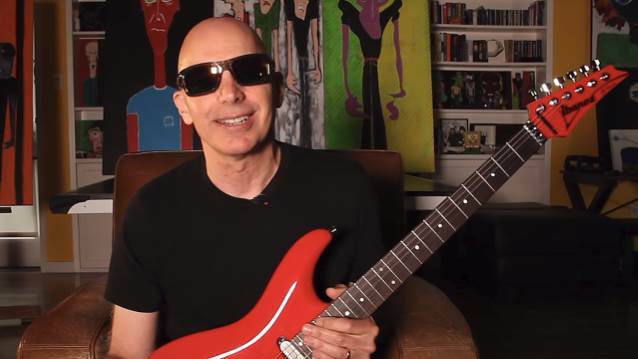 Joe Satriani has announced the details of "Joe Satriani's G4 Experience V5.0: Rocks The Desert", set for January 3-7, 2019 at Hotel Zosa in beautiful Palm Springs, California. The legendary guitarist's fifth annual event will boast the most illustrious and diverse roster of special guests instructors in G4 history, including Rock And Roll Hall Of Famers Neal Schon (JOURNEY, SANTANA) and Rick Nielsen (CHEAP TRICK), Carlos Alomar (David Bowie), Ron "Bumblefoot" Thal (GUNS N' ROSES), Kiko Loreiro (MEGADETH) and Lari Basilio. "The students that have come to the first four 'G4 Experiences' have been as unique and eclectic as you could imagine so for 'G4 Experience V5.0' I've put together a team of instructors that really reflects that diverse nature," says Satriani. "The lineup this year is probably our best yet. It's so exciting, getting to be so totally immersed and getting to be so close to these great players. You never know what's going to happen and at the end of the week you'll think, I went somewhere beautiful, I had fun, I made some new friends, and I grew as a musician. And there's nothing better than that." In addition, Satriani will be joined at "G4 Experience V5.0: Rocks The Desert" by his own crack touring band, Mike Keneally (guitar and keyboards), Bryan Beller (bass), and Joe Travers (drums), all of whom will also serve as instructors and accompaniment for each night's all-star concert. Presented annually by Dreamcatcher Events, "Joe Satriani's G4 Experience V5.0: Rocks The Desert" is an all-inclusive event with a jam-packed schedule sure to keep guests involved from morning until the wee hours of the night. "Joe Satriani's G4 Experience V5.0: Rocks The Desert" will feature four days and night of activities, including multiple workshops led by each instructor, access to fully loaded jam rooms, meet-and-greets, and exclusive nightly concert performances. A variety of guest packages are available, with all registrations including accommodations, three amazing meals a day, parking, Wi-Fi, and an exclusive welcome kit from D'Addario (alcoholic beverages are not included). Musical gear is not provided — guests are asked to please bring their own instruments.